Is it weird that Mambo Number Five got in my head when I started writing the title for this post? Is it weird that I started changing the words to fit with my fosters? “A little bit of terrier in my life, a little bit of Labrador by my side…” Ok, I will stop now. So, before we headed to Washington D.C., I kept a new foster for five days. 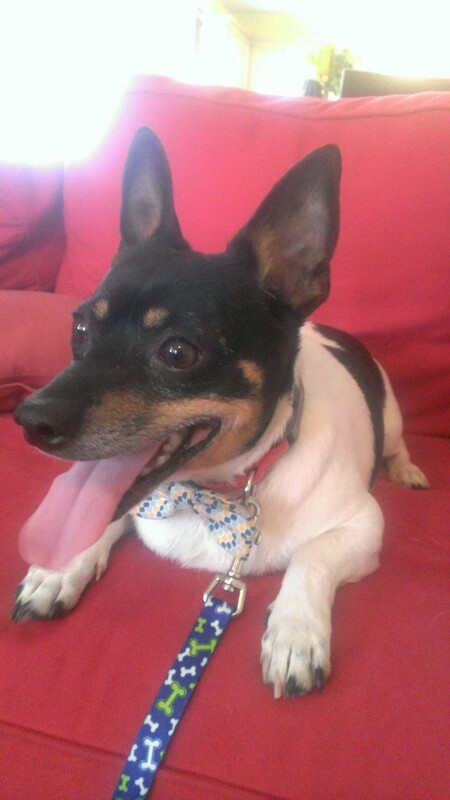 He is a chunky rat terrier mix that never wants to slow down for anything. But he’s super cute, so it balances. By the way, getting a picture of him as incredibly hard because he never wanted to sit still. And I love the bow tie the a volunteer made for him. Bow ties are cool. Anyway, in my foster post, I mentioned that we keep fosters for different reasons. This particular foster was marking (aka making piddles) all over his cage and possibly on a couple of staff and volunteers. They checked him out medically, and he seemed fine, so they wanted me to keep him to see how he would do in a home. He did mark the first night he got here, but that’s kind of normal for a stressed dog who marks that undergoes yet another change in his life. And out of the five days, he only made one other small accident. Overall, he was a great dog. He loved playing in our backyard more than anything else with our dogs. And when he wanted to take a break, he would just jump in our lap and give us kisses. It just breaks my heart to see dogs stress out so much that it surfaces in behavior issues. I’m so glad they gave me the opportunity to give him a bit of a break from the shelter. I look forward to seeing him go to his forever home soon!